The CD is a combination of Ganesha mantras, Atharvashirsha, Stotras and Aaratis. 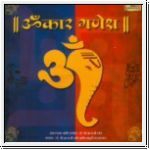 The CD's Aumkar Ganesha and Devi Chants are very useful for the daily required Vedic chants. It is sure that the mantras work on the physiology, neurology and will bring memory, knowledge, creativity, prosperity and peace.